What’s it like ? – Dirty wet dog , boats and sailing. Many people that i have met in my nursing career have asked me ‘what its like’ to go ocean racing or just ocean sailing and cruising : one common misconception and very amusing for me is that we all take our sails down and ‘park’ as one nurse put it for the night, another seriously asked me if we anchored overnight ! Sadly i have no surviving photographs from the time that i worked full time in the sailing industry, first as a crew member in the then Whitbread round the world race…at the time the worlds premier long distance yacht race. From then i spent about 5 years mostly full time aboard maxi yachts as crew, then mate , then skipper and finally as a general hand in the business of running and re-fitting big race boats. Essentially i trashed my career and ran away to sea for a few years and came back a completely different person….i say that it knocked a few of the smooth edges off an left a rougher and tougher person behind, but thats a different story entirely. In this post then i intend to try and give a flavour of what those years were like for me, the scene is very different today as its gone very corporate and increasingly distant from everyday sailing : i probably sailed in the last great race of the amateur boat and corinthian sailor….the environment is the same though as its the same ocean out there whatever the enviro-idiots say. Most of you that come to the blog will know that i usually only post my own content but with the occasional bit of music video thrown in, this post has to be an exception as i just don’t have the content of my own and can’t really access it either. The first video clip is of a boat from the last generation of race boats that i sailed on : that one is what is known as a ‘Volvo’ 70 : the volvo race having taken over from the Whitbread race of my racing era. The boat is as it says on the tin some 70 feet long against the near 80 feet of my ‘maxi’ days but the volvo boats are about twice as fast…..and brutal sailing machines, one comment about them is that the boats performance now exceeds the endurance of the crew to sail them flat out for long periods and do remember that in ocean racing these boats are driven flat out for days and weeks on end. This next clip is the nearest thing that i can find to the boats that i sailed myself : i sailed this boats sistership, not as fast and powerful as todays boats but thats still a big sea …..it is by the way filmed in another of the classic ocean/offshore races : the sydney-hobart. Nowadays the big boats are even bigger : the super-maxi’s being built now are in the 100 foot range with sail areas upwards of twice what we sailed with and hugely powerful , i remember one designer of race boats back then explaining that under full power our rig was producing upwards of 4,000 horsepower equivalent and thats all controlled manually. Today the boats are much more complex with hugely deep keels that can be canted to one side or the other and then multiple daggerboards to keep the thing tracking. The rigs now are enormous and sport huge ‘square-top’ mainsails for power. Many of my friends from my racing years now run and work aboard these kind of boats on a semi-permanent basis, most of them are very good sailors and all have a wide array of technical skills : i for example was both rigger and boat medic and racing seemed often an endless round of mending the crew and splicing up new rigging…that or helping my mate the sailmaker make and mend the 20 plus sails we had aboard. 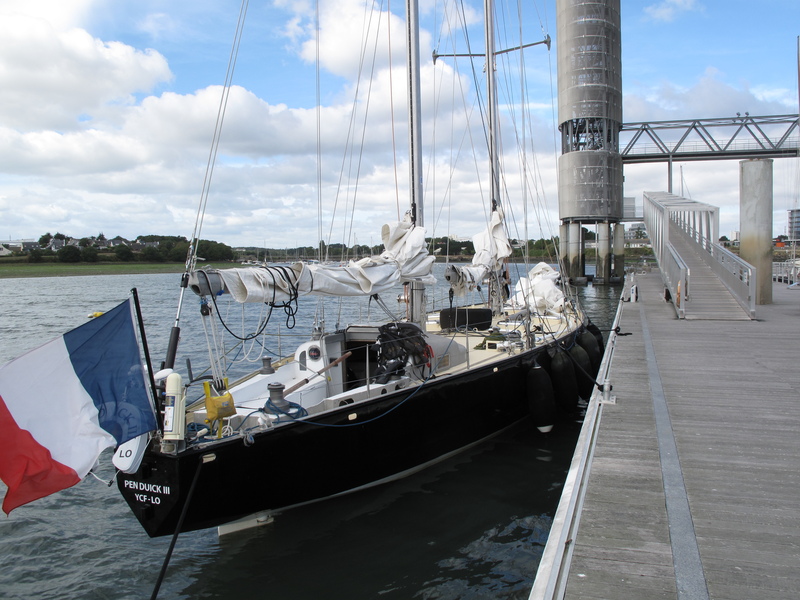 For the last clip here is a tour of one of the latest boats with skipper/driver Ken Read, the boat is called Comanche. Ocean racing is an extreme sport today , it was even in my era : unlike most sports that are played out over a few hours ocean racing is played out at full concentration and focus for days, even weeks on end. Physically its very uncomfortable at times , quite normal to be soaked to the skin for days on end, technically its very complex with most sailors now not just being very god racing sailors (which i am not) but also multi-skilled in the many different disciplines that make up a racing crew today. I was both boat medical officer and one of the riggers, amongst our crew we also had a boatbuilder, a sailmaker, engineer, electronics guru and weather expert. Physically now its very demanding, most crewmembers at a high level will spend hours of gym time just to stay fit enough for the manual side of handling the huge sails and high winch loads. Its a sport also played out often a long way from ‘safety’ ie in the worlds grear oceans : i have been around the Horn 3 times in my career and thats just one wild and lonesome place among many. I came back from my racing days with a sailing name….so just between us if you have been here to the blog you can call me “Big Nurse” or just BN for short as that’s also one of my jobs aboard boat. This post started out as being a short explanatory post aimed at those colleagues of mine who have asked “whats it like” and i hope that the video clips give some flavour of life in ocean racing. For me its also a very reflective piece, one of several that i am working on right now. I was in my 30’s when i was in that scene and nearly double that now so a lot of years have slipped past un-noticed, my reflection now is that i look back on my racing career as a bit of a has been : a little of ‘been there-done that’ although i am at least glad to be a has-been rather than a ‘never-was’. I am glad that i got out there and did it for real, today i have been trying to find an appropriate finisher either in music or prose : here are a couple of attempts. I have had that question as well, how do you get here from the Med whilst anchored in Antigua, do you park at night, this from guests some where so easy to wind up , not that we would ever do that. Good vid clips Steve, Green Dragon was on rails in that, did you see any of the footage from the foilers in the Vendee and whats a foiling “Ultime” going to go like ?